Performers include: Mike Judge, Kathy Najimy, Pamela Adlon, Johnny Hardwic, Stephen Root, Brittany Murphy, Toby Huss, David Herman, Ashley Gardne, Lauren Tom, Tom Petty, Breckin Meyer, Jonathan Joss, Phil Hendrie, Scott Klace, Dennis Burkley, Chuck Mangione, Beth Grant, Danny Trejo, Joanna Gleason, Randal Reeder, Phil LaMarr, Henry Gibson, James Sie, Glenn L. Lucas, Fred Willard, Maurice LaMarche, Dave Thomas, Mac Davis, Cheryl Holliday, Billy West, Trace Adkins, Chris Elliott, Jim Cummings, and Jennifer Coolidge. Though animated, this situation comedy from creator Mike Judge takes a realistic look at American life. 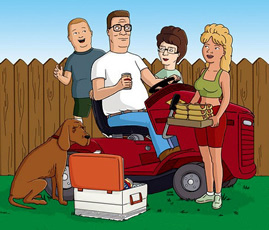 Set in Arlen, Texas, propane gas salesman Hank Hill (Mike Judge) lives with his substitute Spanish teacher wife, Peggy (Kathy Najimy); their awkward and non-sports enthusiast 13-year-old son, Bobby (Pamela Adlon); niece and wannabe beautician Luann Platter Kleinschmidt (Brittany Murphy); and Ladybird Hill, Hank’s beloved bloodhound. Each episode follows their day-to-day lives and focuses on issues at work, at school, and with one another. Hank also spends much of his time obsessing over his lawn and muttering about Bobby being more interested in comedy than football. His friends and neighbors include Dale Gribble (Johnny Hardwick), who is oblivious to his wife Nancy’s (Ashley Gardner) affair, suicidal Bill Dauterive (Stephen Root), and womanizer Boomhauer (Mike Judge). Also playing an important role in the lives of the Hills is Hank’s father Cotton (Toby Huss), Cotton’s second wife and former kindergarten classmate of Hank, Didi (Ashley Gardner), and their infant son, Good Hank or “G.H.,” whose name leads Hank to realize that he was a disappointment to his father. Please bring back King of the Hill after all this time it is still one of the best shows on television. My kids and I love it and watch it faithfully when we find it on. Please BRING BACK KOTH!! My whole family loved the show… Y did they cancel it?? king of the hill is the BEST SHOW EVER !!!!!!!!!!! Man, I will really miss this show. I cant count how many times a new episode made my Sunday. Now, all we have is syndicated episodes. Its just a shame that FOX had to give sundays to that wretched seth mcfarlane. I think that adult swim will be able to find a audience for this great show, like it did for the Family Guy. Let’s just home the Mike Judge will be greatful and return the favor by letting adult swim play the new episodes. One more thing the goode family isn’t funny.